Anipryl also known as L-deprenyl, is a monoamine oxidase inhibitor (MAOi) used in dogs for the treatment of Cushing's disease and canine cognitive dysfunction. It is not known specifically how Anipryl works. However, it is believed that Anipryl prevents the breakdown of dopamine. How it works: Anipryl increases the concentration of a nervous system messenger chemical called dopamine. Higher levels of dopamine improve many cognitive processes. Treating Cushing's Disease has traditionally been centered on suppressing the adrenal gland’s production and release of cortisone. However, this approach has a high potential for side effects. Selegiline has allowed for a new approach by suppressing the pituitary gland directly. Dosage and Administration: Give this medication exactly as directed by your veterinarian. Allow pet to drink plenty of water. If you do not understand the directions ask the pharmacist or veterinarian to explain them to you. Store Anipryl at room temperature away from moisture and heat. Keep this medication away from children and pets. What happens if I miss giving a dose: Give the missed dose as soon as you remember. However, if is almost time for the next regularly scheduled dose, skip the missed dose and take the next one as directed. Do not give a double dose of the medication. What happens if I overdose the pet: Seek emergency veterinary medical treatment. Symptoms of Anipryl overdose include excitement, irritability, nervousness, insomnia, dizziness, severe headache, hallucinations, weakness, sweating and seizures. Possible side effects of Anipryl: If any of the following serious side effects occur, stop giving Anipryl and seek emergency veterinary medical attention; an allergic reaction (difficulty breathing; swelling of the lips, tongue or face; hives), a severe headache, restlessness, agitation, or irritability, sweating, convulsions, uncontrollable or irregular movements. Other less serious side effects may occur. Continue giving Anipryl and talk to your veterinarian if your pet develops dizziness or drowsiness, nausea, abdominal pain or diarrhea, insomnia, mild confusion, agitation or anxiety, dry mouth. Other side effects may also occur. Talk to your veterinarian about any side effect that seems unusual or bothersome to the animal. What should I avoid while giving Anipryl to my pet: Anipryl may cause dizziness or drowsiness. Do not give higher doses than those prescribed. What other drugs will affect Anipryl: Before giving Anipryl tell your veterinarian if your pet is also taking fluoxetine or meperidine. Talk to your veterinarian or pharmacist before giving any prescription or over the counter medicines. What should I discuss with my veterinarian before giving Anipryl to my pet: Anipryl should not be given if the pet is taking meperidine. Tell your veterinarian about any other medical conditions your pet has. Tell your veterinarian if your pet is pregnant or lactating. 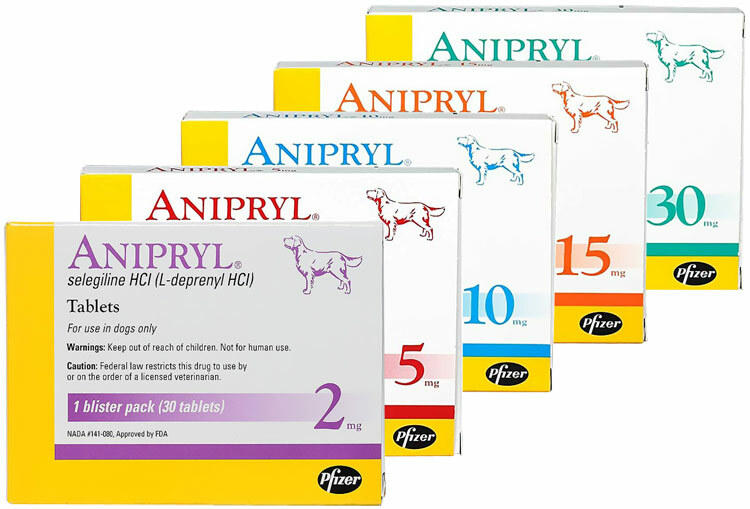 What is the most important information I should know about Anipryl: Anipryl is a prescription medication FDA approved for veterinary use in the treatment of Cushing's disease caused by a pituitary tumor in dogs. Anipryl is also used to treat canine cognitive dysfunction. Anipryl is available as 5mg, 10mg, 15mg and 30mg tablets. The usual initial starting dose to treat Cushing's disease in dogs is 0.45mg/pound given once a day in the morning. If no results within 2 months may increase to 0.9mg/pound once a day. If still no response after one month of the increased dose, reevaluate the pet. The dose for canine cognitive dysfunction is 0.2-0.45mg/pound. It may take up to one month or more to see improvement. Do not give more of this medication than is prescribed without consulting your veterinarian. Anipryl may cause drowsiness or dizziness. Cautions: Because Anipryl belongs to a class of drugs called Monoamine Oxidase Inhibitors (MAOI) it should not be given with antidepressants such as Prozac. Do not use in pregnant or nursing animals. If any serious side effects occur (difficulty breathing, hives, agitation; swelling of the lips, tongue or face), stop giving Anipryl and seek emergency veterinary medical attention.